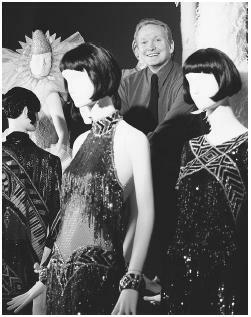 Bob Mackie posing with some of his designs at the "Unmistakably Mackie" retrospective at the Fashion Institute of Technology in New York, 1999. Dressing for Glamor (with Gerry Brenner), New York, 1979. Pecktal, Lynn, Costume Design: Techniques of Modern Masters, New York, 1993. DeCaro, Frank, Unmistakably Mackie: The Fantasy and Fashion of Bob Mackie, New York, 1999. Thomas, Kay, "Spotlighting Two Designers Who Took Broadway byStorm," in the New York Daily News, 28 November 1971. "Bob and Ray," in Newsweek, 11 June 1973. Moore, Didi, "Designing Man," in US, 19 January 1982. Rittersporn, Liz, "Bob Mackie: The World's Most Visible Designer," in the New York Daily News, 5 May 1985. Oney, Steve, "Bob Mackie: Daring, Dazzling Designer to the Stars," in Cosmopolitan (London), April 1986. Milbank, Caroline Rennolds, "Bob Mackie," in Interview (NewYork), December 1986. Michaels, Debra, "Bob Mackie: Cashing in on the Glamor," in WWD, 19 April 1988. "Bob Mackie," in Current Biography (New York), October 1988. Mansfield, Stephanie, "Bob Mackie, the Boogie-Woogie Bugle Bead Boy of Seventh Avenue, Wants to Be Taken Seriously," in Vogue (New York), February 1990. Finke, Nikki, "Trouble in the House of Mackie," in Vanity Fair, June 1993. Chase, Anthony, "Designer Sketchbook: Moon Over Buffalo," in TCI (New York), November 1995. Schiro, Anne-Marie, "Into the Evening with Elegance," in the New York Times, 2 April 1996. Slingerland, Amy L., "Blue Suede Shoes," in TCI (New York), March 1997. DeCaro, Frank, "Fashion Chat," in TV Guide, 22 March 1997. "Bob Mackie," in People, 16 February 1998. Barbour, David, "ED Designer Sketchbook: Stayin' Alive," in Entertainment Design (New York), February 2001. Szabo, Julia, "All Hams on Deck," in the New York Times Magazine, Spring 2001. Bob Mackie is one of a handful of designers to work with success in the related but disparate fields of theater and fashion design. He is probably best known for the wittily revealing, glamorous beaded and feathered ensembles he designed for actress and singer Cher since the early 1970s. This collaborative image remains so strong that to visualize Cher is to see her dressed by Mackie. His true genius as an interpretative designer, however, can best be seen in his work for comedian Carol Burnett. Bob Mackie, fall 2001 "Foreign Intrigue" collection: beaded slip top minidress with an ostrich coat. visual trademarks, so their personalities remained the focus, supported by wig and costume, even when they played comic or character roles. When he turned to ready-to-wear in 1982, Mackie's name had been before the television viewing public for 15 years. Women who had admired the casual but elegant tailored outfits Burnett wore to open and close her show or the dramatic allure of Cher's gowns formed an eager and ready market for the first designs from Bob Mackie Originals. The fashion press took rather longer to convince that the aptly dubbed "sultan of sequins, rajah of rhinestones" had the necessary seriousness of purpose to sustain a career on Seventh Avenue. Yet Mackie has always designed day and evening clothing in addition to his theatrical work. As early as 1969, he and partners Ray Aghayan and Elizabeth Courtney established their Beverly Hills boutique, Elizabeth the First, which in turn spawned the short-lived wholesale firm Ray Aghayan/Bob Mackie. In his 1979 book, Dressing for Glamor, Mackie states his belief that glamor is "a state of mind, a feeling of self-confidence." His strength as a designer is an intuitive understanding of what makes a woman feel self-confident and well dressed—solid craftsmanship, attention to detail, clothes that combine wit and artistry with a sense of flair and drama. In 1995 Moon Over Buffalo took to the stage. With Mackie's outstanding costume design and makeup artistry, the Broadway production became a hit. Directed by Tom Moore, the play featured Carol Burnett and Philip Bosco yearning for Hollywood careers. It takes place in the 1950s, in a time where actresses never went anywhere without being made up. Mackie had his work cut out for him: costumes were bold in color and contrasted with room schemes. Referring to a purple-and-white ensemble and a bright green suit, Mackie says, "Those colors are accurate to the period. Clothes were a lot more flamboyant in the 1950s than we're used to seeing now." In March 1997 TV Guide sat down with Mackie to discuss the importance of shock value in fashion. "It gives you something to talk about at the office the next day," the designer explained. But when it comes to hairstyles, Mackie said to stick with what you know, "It's like on your wedding day, don't try a new hairdo. You should look like yourself. My idea of a real movie star is someone who you know who they are, no matter what they play or where they are." With costuming Vegas showgirls, disco divas, Cher, and numerous Broadway productions in his past, Mackie took his career to a new and different level—ballet. Danced to master recordings of Elvis Presley songs, the Cleveland San Jose Ballet's Blue Suede Shoes was the first project in which Mackie designed not only costumes but the sets as well. He is, in fact, one of the few costume designers who has expanded his work into set design. Responsible for 230 costumes and 12 sets, Mackie's flashy style fit right in with the 1970 trends. With men in bell-bottomed pantsuits and showgirls in brightly sequined body stockings, the show's well-deserved applause speaks for itself. In the off-Broadway musical Pete & Keely, Mackie once again nailed the era—the 1960s—perfectly in his designs. Renowned for costume design after costume design and even set design after set design, Mackie is the first to admit he can't take all the credit. The modest legend claims, "I was showing lingerie while everybody else was showing evening gowns. I was rather well known because of all the people I dressed at the time." That may be true, Mackie, but now perhaps, you're the reason others become known.